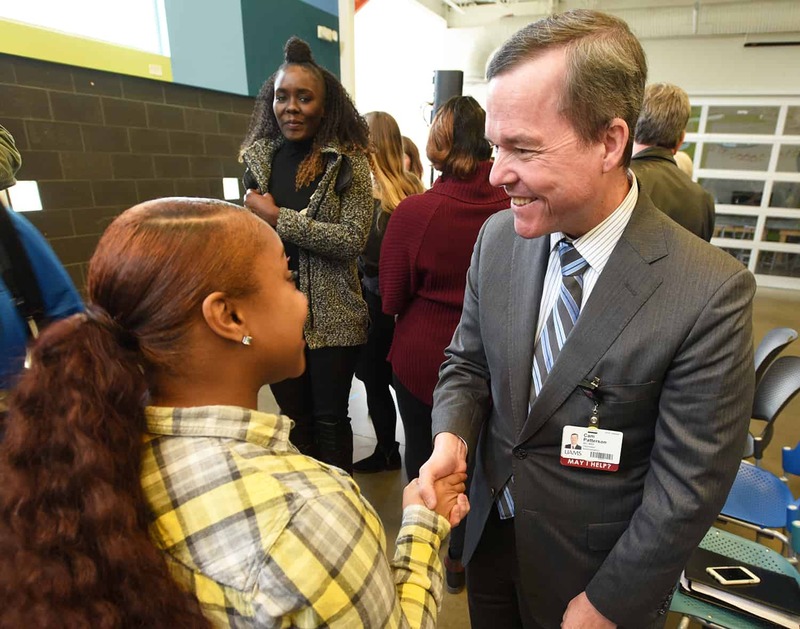 UAMS Chancellor Cam Patterson greets Ke’undra Gilder, who spoke about getting her life on track with help from Our House. Nov. 13, 2018 | A program to provide homeless and near homeless pregnant women and mothers with young children access to behavioral health services was announced today by the University of Arkansas for Medical Sciences (UAMS) and Our House, a Little Rock non-profit center serving homeless and near-homeless populations in central Arkansas. The Home Together project is funded with a five-year, $2.5 million grant from the Substance Abuse and Mental Health Services Administration, part of U.S. Department of Health and Human Services. It will allow expansion of a program already in place at Our House that provides services to homeless families to help them reach self-sufficiency. The expansion will incorporate behavioral health care as part of connecting low-income families with the training and tools to achieve housing, financial and family stability. 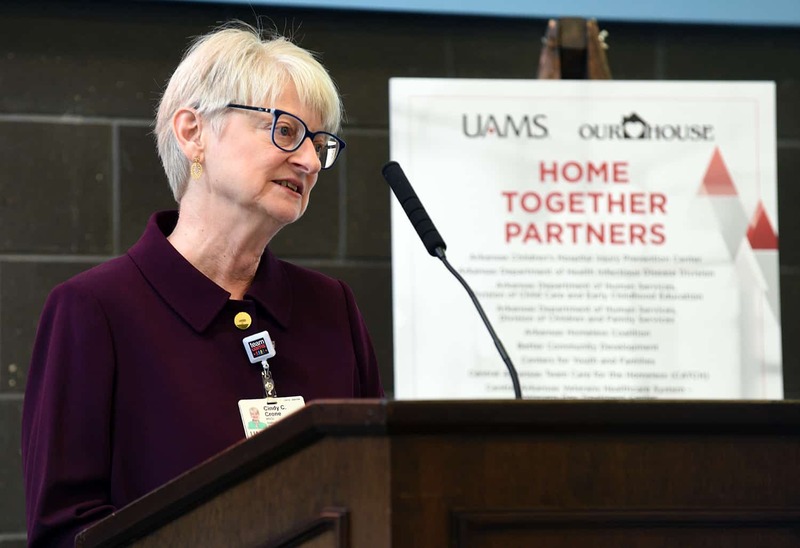 Cindy Crone, with the UAMS Fay W. Bozeman College of Public Health, received the $2.5 million grant to provide behavioral health services to homeless pregnant women and mothers with young children. The announcement was made at a news conference at Our House by UAMS Chancellor Cam Patterson, M.D., MBA. ; Cindy Crone, M.N.Sc., A.P.R.N, with the UAMS Fay W. Boozman College of Public Health; and Our House Executive Director Ben Goodwin. 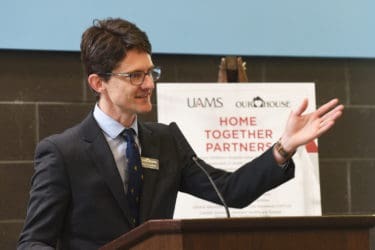 “UAMS is glad to partner with Our House because we recognize that by helping the mothers, it will also help the children so they do not grow up to be the next generation of parents living in poverty with behavioral health and/or substance use problems,” Patterson said. Ben Goodwin is executive director of Our House, which provides services to homeless families to help them reach self-sufficiency. Crone, who received the grant, will oversee the program, while Our House will be the direct service provider. The target population is families that include a pregnant woman or mother of children under age 5 who also has a mental illness or co-occurring mental illness and substance use disorder and is experiencing homelessness. “We want to decrease family homelessness in central Arkansas and in a way where families move out of poverty in the long term and are successful and healthy,” Crone said. The original homeless prevention program, Central Arkansas Family Stability Institute (CAFSI), was begun by Our House six years ago with private funding from the Siemer Family Institute and the Heart of Arkansas United Way and later expanded with funding from the W.K. Kellogg Foundation. The purpose of the program is to work with families in or on the verge of homelessness to achieve lasting self-sufficiency. The program has a 93 percent success rate of helping families avoid an episode or a return to homelessness after 12 months. But lack of consistent access to mental health services has been a significant challenge to the program’s growth and effectiveness. The grant will allow Our House to double the number of families it serves through its CAFSI program from 90 a year to 180 a year over five years totaling about 880 families (3,000 individuals). A large portion of families are expected to be low-income, medically underrepresented minorities, Crone said. Our House will add an additional three CAFSI case managers and a child and family therapist. New services to address health disparities include access to primary and behavioral health care, HIV prevention and tobacco use cessation. Case managers will help develop a family stability plan to teach self-care and chronic disease management. Arkansas has the fourth worst child homelessness problem in the United States, Crone said. At UAMS Medical Center alone, about 30 babies are discharged every month to mothers who are homeless or near homeless. A majority of these mothers have a serious mental illness, a substance use disorder or both. Many of these families become involved with the child welfare system.